Most of us have occasionally daydreamed about early retirement. Have you gone a step further, crunching some numbers to figure out how much money you would need and cutting back on your spending so you can max out your savings rate? 1. Be ready to take some risk. If your money needs to last 40 or 50 years, it will have to keep growing after you retire. That means you will need to continue investing somewhat aggressively. The exact balance of stocks versus lower-risk investments will depend on your age and risk tolerance, but investment professionals recommend keeping a minimum of 50 percent of your portfolio in stocks, and some advise 70 or 80 percent. "The younger you are, the more investment risk you have to take, regardless of what the situation is," says Michael Kresh, CFP, the chief investment officer of Creative Wealth Management. A risk questionnaire, such as the one by investment firm SigFig, can help you determine what portion of your portfolio should be in stocks, given your investment horizon and risk tolerance. 2. Keep some cash on hand. For younger retirees, financial planners recommend keeping about two years' worth of living expenses in cash or short-term instruments like money market accounts or CDs. "You don't want to get in a position where you're selling into a down market just to maintain your standard of living," Kresh says. Sitting on some cash will allow you to sell chunks of stocks when the market is strong, not when you have to pay the cable bill. As for the balance of your portfolio -- whatever isn't in stocks or cash -- the pros recommend shorter-term bonds for now, because interest rates are so low. "Even though the rate is not fair to savers, it's still something to get a safe return and hedge the risk of the equity side of your portfolio," says Mickey Cargile, the president of Cargile Investment Management. 3. Don't overspend. The general rule of thumb for someone living off an investment portfolio is to keep withdrawals to 4 percent a year. Some experts now say that even that is too high, but it is still a reasonable place to start, Cargile says. "Some years it's going to erode your principal some, and some years it's going to grow much more," he says. "If you can withdraw less early on, that's great," Cargile adds. In those early years in particular, you still want your total portfolio to be growing faster than you are spending it. 4. Watch out for friends with investment ideas. This is a common trap for people who are successful early in life, Kresh says: A friend or family member approaches them with a supposedly can't-miss investment or business idea, and, overconfident because of that early success, they put too much money behind a risky venture. "You think because you've been successful early that you can understand other businesses that you have not been involved in," Kresh says. 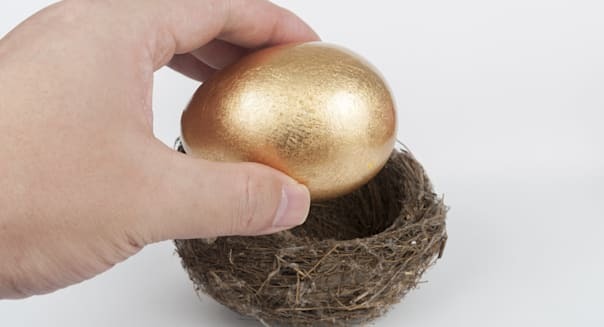 Even a large nest egg won't last a lifetime if you start throwing money at ill-advised schemes. 5. Find something to do. Investment managers say that being emotionally prepared for retirement is a challenge for their clients at any age -- and one that often takes people by surprise. "I think as human beings we weren't meant to sit around and watch Jeopardy for 30 years," Cargile says. Idleness may appeal now, when you are stuck in an office, but people who work with retirees say the ones who enjoy their retirement find a purpose for all that free time. "You need to have something to get up for," says Roger Streit, a certified financial planner with Key Financial Solutions. Volunteering for an organization or cause you are passionate about is one good option, Streit says. "I think it definitely helps to have a cause, to be involved in giving back," he says. Retiring at 40 may be nothing more than a pipe dream for most of us, but even those of us who don't plan to retire early should plan for a long retirement. If you stop working at the traditional retirement age of 65, investment managers say you should plan to make your money last about 30 years. That may mean you will need to work, or work part-time, longer -- or take some of the tips we just shared. Sarah Morgan is a contributing writer at SigFig. Nearly a million people use SigFig to track, improve and manage over $300 billion in investments.